Menemsha Creek is located on the far western side of Marthas Vineyard about eight miles southeast of Cuttyhunk Island and 38 miles west of Nantucket Harbor. 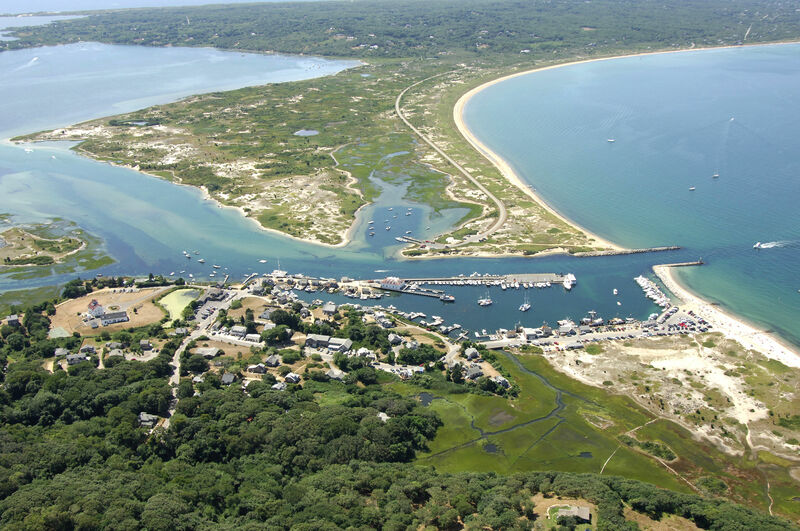 Menemsha Pond eventually leads to Menemsha Creek, which is a well-protected and isolated area that has an excellent anchorage. If you are trying to escape the hustle and bustle of more crowded areas and are self-sufficient, you can spend a couple of quiet, peaceful nights on Menemsha Pond with little to bother you. The bugs can be a little bothersome of the wind is down, though. 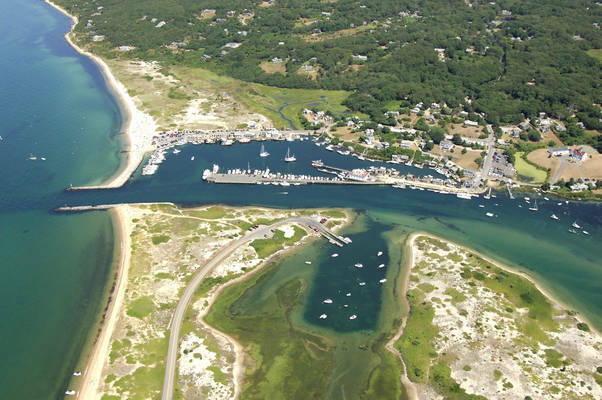 There are two marinas on Menemsha Creek, but none on Menemsha Pond. Menemsha Texaco Service is strictly a fuel dock and pumps gas and diesel fuel. 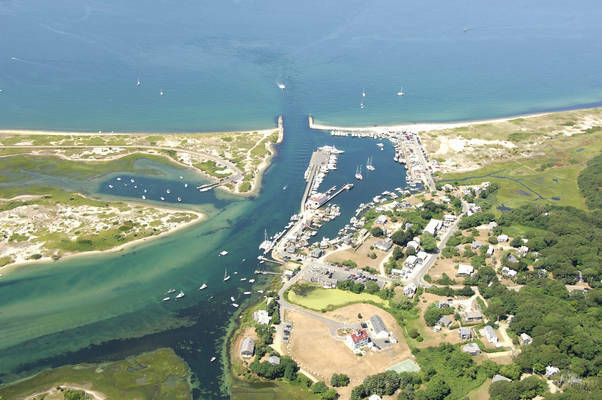 Menemsha Basin, however, does accept transient guests at their slips. 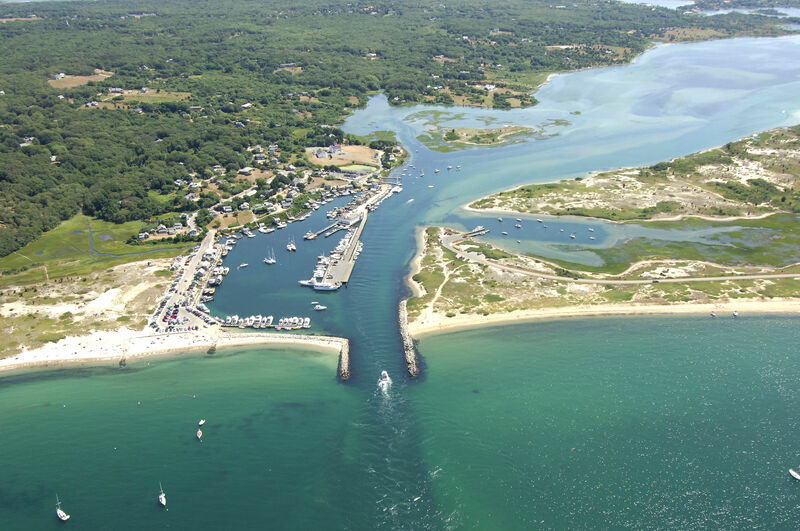 The image above is a view from the north looking south over the jettied entrance to Menemsha Creek. 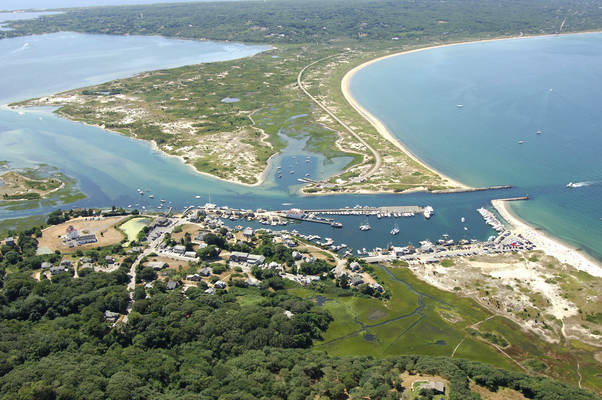 Off to port (east) is Menemsha Texaco Service and Menemsha Basin, the only two marinas in Menemsha Creek. Off in the upper-right-hand portion of the image, the passage back toward Menemsha Pond can be seen. 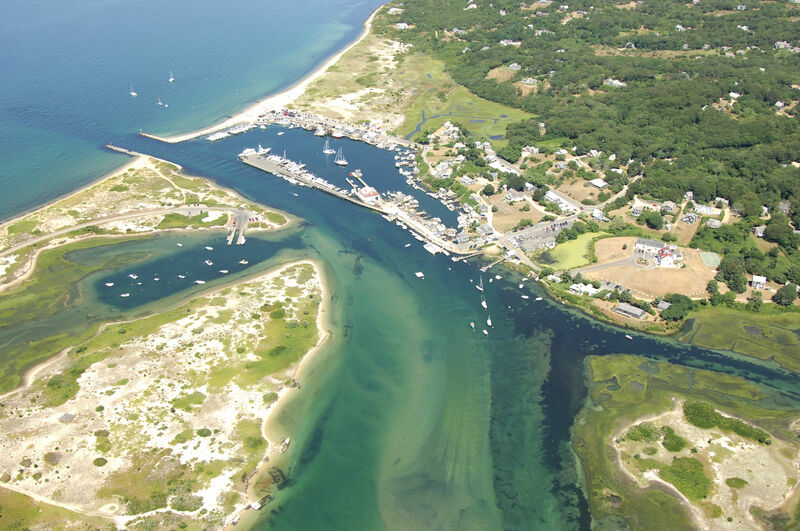 Menemsha Creek is reached via an approach from the north through Vineyard Sound. From Vineyard Sound, first set a course to intercept green can buoy 1, which is located near waypoint N41 21.367 W70 46.251. Once you have safely navigated to green can 1, you should be able to see the jettied inlet. Flashing green 3 is located on the east jetty and serves as the sole lighted aid into Menemsha Creek if you are traveling at night. Red daybeacon 2 is located on the east jetty. Once inside, you can turn into the Menemsha Basin for fuel or an overnight slip or head south into Menemsha Pond and drop the hook. There are a set of limited moorings just inside the creek as well. No reviews yet! Be the first to write a review of Menemsha Creek.